​The Virgin Mary Girls’ School community believes that each pupil has a right to an education free from fear and intimidation. Our ethos is to foster self-esteem in an all-inclusive harmonious environment. Every member of the school community has a part to play in prevention of bullying i.e. staff, parents, pupils, ancillary staff and the Board of Management. The school regards bullying as a serious infringement of individual rights and a serious threat to the self-esteem and self-confidence of targeted pupil(s). Therefore it does not tolerate bullying of any kind. Every report of bullying is treated seriously and dealt with, having due regard for the well being of the targeted pupil(s) and the perpetrator(s). An 'Anti-Bullying Team,' made up of staff members, exists to cultivate an environment free from bullying. The immediate priority, should a bullying incident occur, is ending the bullying, (thereby protecting the person(s) being targeted) and resolving the issues and restoring the relationships involved insofar as is practicable using a “Reform, not Blame” approach. All pupils are expected to contribute to the creation and maintenance a safe environment in the school. On becoming aware of any bullying situation, in or outside the school, involving members of the school community they should notify a trusted responsible adult. Bullying behaviour is too serious not to report. Pupils’ participation in school life in general is encouraged through existing school structures. Awareness of bullying, and willingness to take action to prevent or stop it, is part of this participation. In accordance with the requirements of the Education (Welfare) Act 2000 and the code of behavior guidelines issued by the NEWB, the Board of Management of the Virgin Mary Girls’ School has adopted the following anti-bullying policy within the framework of the school’s overall code of behavior. This policy fully complies with the requirements of the Anti-Bullying Procedures for Primary and Post-Primary Schools, which were published in September 2013. Bullying is unwanted negative behavior, verbal, psychological or physical conducted by an individual or group against another person (or persons) and which is repeated over time, it is deliberate, hurtful and repeated. - identity-based bullying such as homophobic bullying, racist bullying, bullying based on a person’s membership of the Traveller community and bullying of those with disabilities or special educational needs. Isolated or once-off incidents of intentional negative behavior, including a once-off offensive or hurtful text message or other private messaging, do not fall within the definition of bullying and should be dealt with, as appropriate, in accordance with the school’s code of behavior. However, in the context of this policy, placing a once-off offensive or hurtful public message, image or statement on a social network site or other public forum where that message, image or statement can be viewed and/or repeated by other people will be regarded as bullying behavior. This definition includes a wide range of behaviour, whether verbal or written, whether physical or social, whether targeting person or property, whether carried out directly or indirectly or through any electronic or other medium, which could harm a pupil or undermine her/his self-esteem or self-confidence. Appendix 1 gives a list of specific examples of bullying behaviour. This list is not exhaustive. Additional information on different types of bullying is set out in Section 2 of the Anti-Bullying Procedures for Primary and Post-Primary Schools. 3. The “Relevant Teacher(s)” for investigating and dealing with bullying in this school is: the class teacher. The anti-bullying module of the SPHE programme as it applies during each school year. At least five awareness-raising exercises per school year for each class group (e.g. from the “Awareness-Raising” strand of the Anti-Bullying Campaign, via its website), pro-actively explaining the nature and variety, causes, consequences and unacceptability of bullying. Pupils are helped to examine the issue of bullying in a calm rational way, outside of the tense context of particular bullying incidents. In the process they are made more aware of the nature of bullying and the various forms that it can take. Pupils are made aware that the consequences of bullying behaviour are always bad for those who are targeted, even if this is not always obvious at the time. Pupils are encouraged to recognise, reject and report bullying behaviour, either spontaneously or through questionnaires that are regularly used in the school. Through presentations or other exercises, the school staff and parents/guardians are made aware of the nature of bullying and the signs that might indicate that a pupil is being bullied. They are encouraged to be vigilant in watching out for signs of bullying and to report any suspicion of bullying they may have to the “Relevant Teacher. Through regular reports in school newsletters and other communications as well as at meetings with parent/guardian groups parents/guardians are regularly informed of the activities of the school 'Anti-Bullying Team' and encouraged to support its work. · An annual anti-bullying/friendship day/week. o Teachers are constantly on the look out for behaviour that might give rise to bullying. o Anxious and vulnerable pupils are kept under close observation by yard supervisors. o Ensuring children line up in a disciplined manner, can avoid harassment for some pupils. o Teacher on the yard is responsible for informing the class teacher. · The ‘Relevant Teacher’ investigates all instances of reported or suspected bullying behaviour with a view to establishing the facts and bringing any such behaviour to an end. · The School, through the ‘Relevant Teacher’ reserves the right to ask any pupil to write an account of what happened, as part of an investigation. This will be a standard procedure and does not necessarily imply that a pupil is guilty of misbehaviour. · Pupils who are alleged to have been involved in bullying behaviour are interviewed by the ‘Relevant Teacher’ to establish the nature and extent of the behaviour and any reasons for it. In the event that they have been involved in bullying behaviour they are asked to sign a binding promise that they will treat all pupils fairly, equally and respectfully including the targeted pupil(s). · The 'Relevant Teacher’ does not apportion blame but rather treats bullying behaviour as a "mistake" that can and must be remedied. She emphasises that the intention is not to punish perpetrators but to talk to them, to explain how harmful and hurtful bullying is and to seek a promise that it will stop. If that promise is forthcoming and is honoured there will be no penalty and that will be the end of the matter. Pupils who report bullying therefore are not getting others "in trouble" so much as enabling them to get out of trouble into which they may ultimately get if the bullying continued. · When an investigation is completed and/or a bullying situation is resolved the 'Relevant Teacher' will complete a report, to include the findings of the investigation, the strategy adopted and the outcome of the intervention, as well as any other relevant information. · If a pupil has signed such a promise but then chooses to break that promise and continue the bullying behaviour, this can then no longer be considered a "mistake." In this event parent(s)/guardian(s) will be informed and requested to countersign their daughter’s promise. Breach of this additional promise by further bullying behaviour is regarded as a very grave matter and a serious sanction may be imposed by the school authorities (See sanctions below). All documentation regarding bullying incidents and their resolution is retained securely in the school. - Parent(s)/guardian(s) may be invited to a meeting with the ‘Relevant Teacher’ and the Principal and the pupil may be suspended from school. Helping bullied pupils raise their self-esteem by encouraging them to become involved in activities that help develop friendships and social skills (e.g. participation in group work in class and in extra-curricular group or team activities during or after school). In dealing with bullying behaviour seeking resolution and offering a fresh start with a “clean sheet” and no blame in return for keeping a promise to reform. ​8. The Board of Management confirms that the school will, in accordance with its obligations under equality legislation, take all such steps as are reasonably practicable to prevent the sexual harassment of pupils or staff or the harassment of pupils or staff on any of the nine grounds specified i.e. gender including transgender, civil status, family status, sexual orientation, religion, age, disability, race and membership of the Traveller community. 9. This policy was adopted by the Board of Management on 8/4/2014 and updated annually. 10. This policy has been made available to school personnel, published on the school website, is readily accessible to parents and pupils on request and provided to the Parents’ Association (where one exists). A copy of this policy will be made available to the Department of Education and Skills and to the patron if requested. 11. This policy and its implementation will be reviewed by the Board of Management once in every school year. Written notification that the review has been completed will be made available to school personnel, published on the school website is readily accessible to parents and pupils on request) and provided to the Parents’ Association (where one exists). A record of the review and its outcome will be made available to the Department of Education and Skills and to the patron if requested. Offensive gestures and unwanted physical contact. Deliberate staring with the intent to discomfort. Persistent rudeness in behaviour and attitude toward a particular individual. Asking inappropriate questions/making inappropriate comments re. social life or schoolwork. Deliberately refusing to address issues focusing instead on the person. Blaming a pupil for things she/he did not do. Catch them being good - notice and acknowledge desired respectful behaviour by providing positive attention. The Board of Management must undertake an annual review of the school’s anti-bullying policy and its implementation. The following checklist must be used for this purpose. The checklist is an aid to conducting this review and is not intended as an exhaustive list. In order to complete the checklist, an examination and review involving both quantitative and qualitative analysis, as appropriate across the various elements of the implementation of the school’s anti-bullying policy will be required. · Keep unhelpful hands, feet, objects and comments to yourself. · Know the difference between TELLING and TELLING ON. Tell yourself that bullying is wrong. You do not deserve to be bullied. If the bullying has happened by text message or on the Internet do no delete the message without copying it or taking a screenshot/photo of it. Encourage people who are bullied to join in with group games etc. Be aware of the school’s policy on bullying. Remember we are a telling school. The staff are always willing to speak with parents but remember to organise a good time to talk. Get more information on bullying and be comfortable with your understanding of it. Maintain good communication with your child, provide opportunities for one-to-one chats. 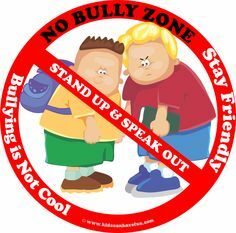 Support any bullying awareness campaigns in the school and wider community. Remember, there will always be conflicts between children. However bullying is different to the normal conflicts that children have. Respect your child and teach them to respect others. Don’t let your children come to school too early or hang around after school – there is only supervision during school hours. If you witness what appears to be a bullying incident in the school, make your concerns known to a member of staff. What if your child is involved in bullying? If your child tells you they have witnessed a bullying incident, find out what happened and let the school know. If your child is upset over something that happened to them, try to determine whether there was genuine bullying involved. Again you can approach the teacher and get their perspective. Be aware of the signs and symptoms of bullying and watch for signs your child may be being bullied. If you are worried that your child is being bullied, ask him/her directly. Give your child a chance to vent his/her feelings about being bullied. But remember to stay calm and listen to your child. Empower your child with the skills to deal with bullies. Help children practice strategies such as shouting no, walking with confidence and keeping away from bullies. If the bullying is happening on the way to or from school arrange to meet your child and walk with them. If your child has been identified as displaying bullying behaviour, stay calm and don’t panic. Try to find out the reasons why. Promote a culture of respect in the school – children respecting children, children respecting staff, staff respecting children, staff respecting staff. Praise respectful behaviour. Tell the pupils from Day One that bullying is not tolerated in the school. Make sure children know the difference between bullying and normal conflict. Ensure that children, parents and teachers take responsibility for any bullying that goes on in the school. Everyone is expected to ensure that it does not happen. Promote the idea of the school as being a telling school. Explain the difference between telling about and telling on. Tell children to tell and back them up. Raise awareness of the school policy on bullying. Keep parents informed and involved. Use circle time or class based discussion to discuss bullying behaviour with the class. Role-play situations and discuss possible solutions or strategies. Be open to involving pupils in developing ideas. If they are part of the problem they can be part of the solution. Discuss the general discipline policy and anti-bullying policy with the class. Teach children to be confident. Differences should be acceptable and never a cause for bullying. Be guided by the steps outlined in the Anti-Bullying Policy. Support and encourage pupils to report bullying. Provide a discrete way for pupils to report bullying and encourage pupils who witness it to report. Take bullying seriously and find out the facts when told about a possible incident of bullying. Gather information, talk to the pupils involved individually. Keep a written record of dates, incidents and steps taken. If an incident of bullying occurs, challenge it directly and follow the steps in the bullying policy. Support children who are being bullied and help the bullies to change their behaviour. Inform parents (informally at first), ask for their suggestions and seek their support. If the bullying is about a particular issue (e.g. differences among pupils), you could initiate a discussion on the issue in class, but not focused on any particular child. Watch out for signs which may point to a child being bullied, be aware of suspicious you may have based on children’s behaviour. If necessary break up the group dynamics by assigning places. Most bullying groups have a leader with other children being frightened of not bullying. Turn peer pressure against bullying. From Department of Education and Skills Anti-Bullying Procedures for Primary and Post-Primary Schools (September, 2013).